How do Banks Cash in on Engagement on Social Media? As consumers spend more and more time on social media, it becomes essential for brands across industries to maintain an active presence here. However, brands are finding it difficult to get through to their audience. This is because social media networks strive to provide an enriching experience for their users. The bar for engaging social media content is set quite high. In this article, we’ll take a close look at the banking industry. 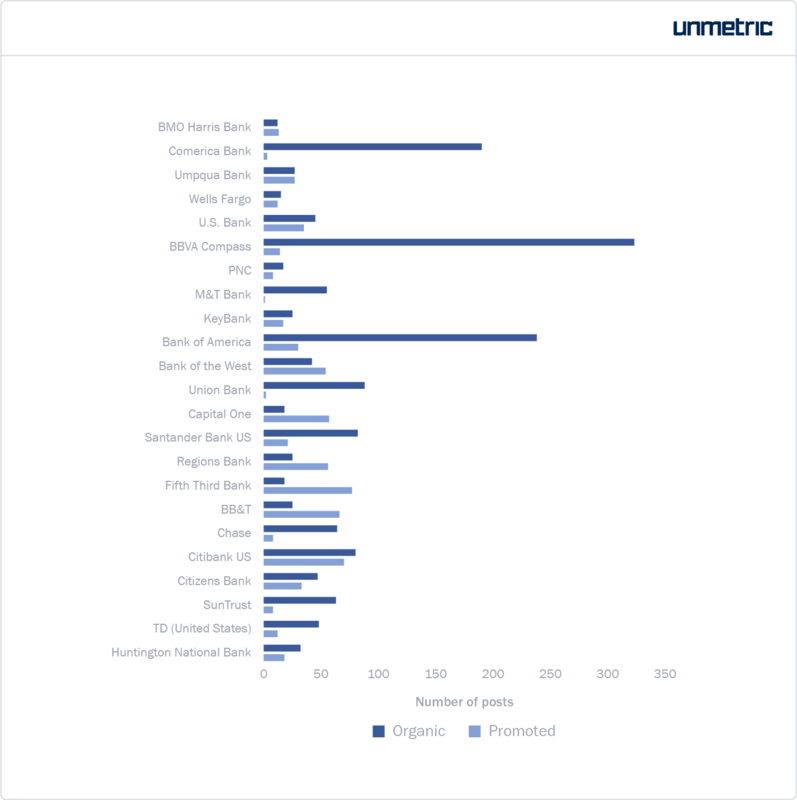 First, we’ll analyze how 23 top banks in North America perform on social media. From this, we will mine insights and best practices that you can apply to your social media marketing. The banks included in this analysis are: Bank of America, Bank of the West, BB&T, BBVA Compass, BMO Harris, Capital One, Chase, Citi, Citizens Bank, Comerica, Fifth Third Bank, Huntington, KeyBank, M&T Bank, PNC, Regions Bank, Santander Bank, SunTrust, TD, Umpqua Bank, Union Bank, US Bank and Wells Fargo. 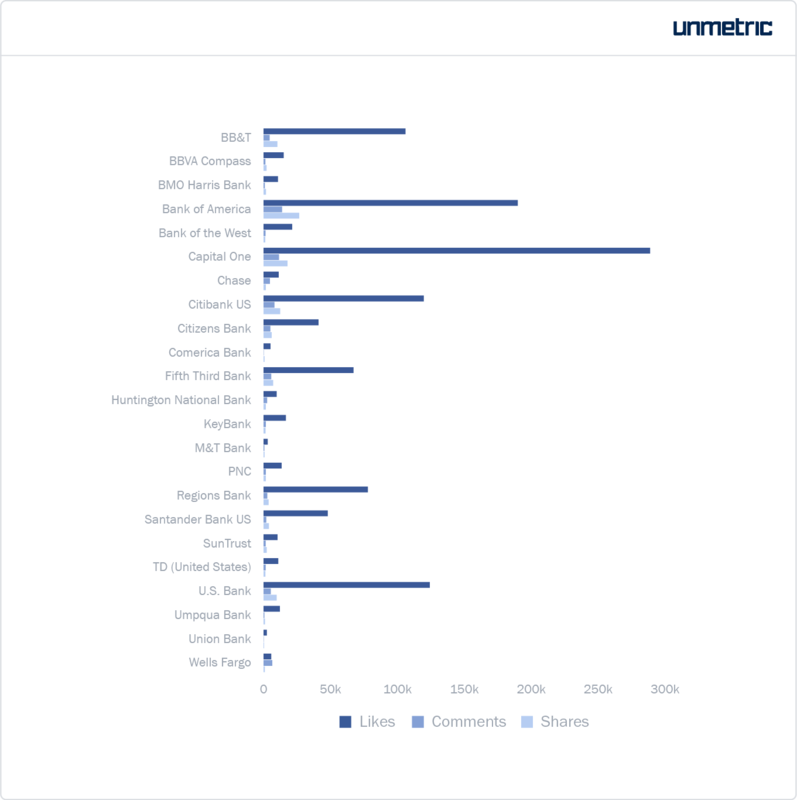 Even with organic reach hitting abysmal lows, brands cannot ignore Facebook in their social media marketing. This is the only network where all the brands studied here have an active presence. Let’s take a closer look at what they use Facebook for and how effectively. Engagement indicates how successful a brand has been in retaining their audience’s attention. It is also a measure of how interested and responsive they are to your content. 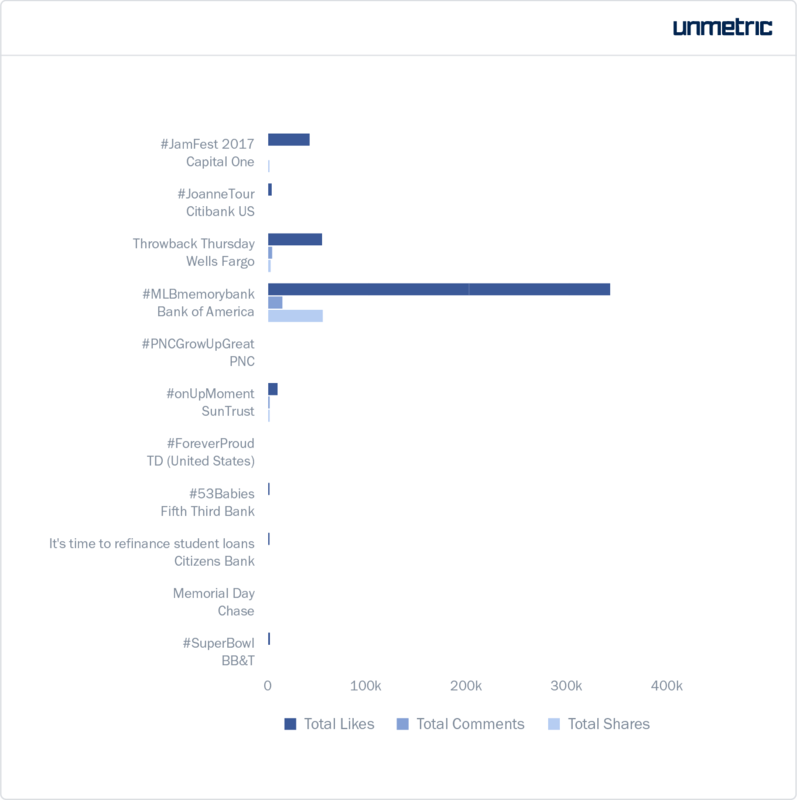 Capital One brought in more likes overall, but Bank of America takes the lead in overall shares and comments (see chart below). This is also because Bank of America posted 287 times compared to Capital One’s 79. What did Capital One do to get so much engagement? The banks studied here posted on average 101 times during the first half of 2017. Capital One, however, got greater engagement by posting below the average volume. While we found there to be no correlation between posting volumes and engagement, promoting a large number of posts could be a factor in Capital One’s exceptional performance. Evidently, Capital One promoted a large chunk of their content. Out of the 79 posts, 57 were most likely promoted. It does not lead us to the conclusion that promoting a sizeable portion of your posts will guarantee engagement. Take a look at Fifth Third Bank, for example. They promoted close to 81% of their posts. However, they have not received such outstanding levels of engagement as Capital One has. Instead of betting on one content type to fetch them all the engagement, they’ve optimized the volume of each kind of content. This is remarkable because each content type performs a specific function. For example, you can use links to redirect traffic to your website, branded portals etc. 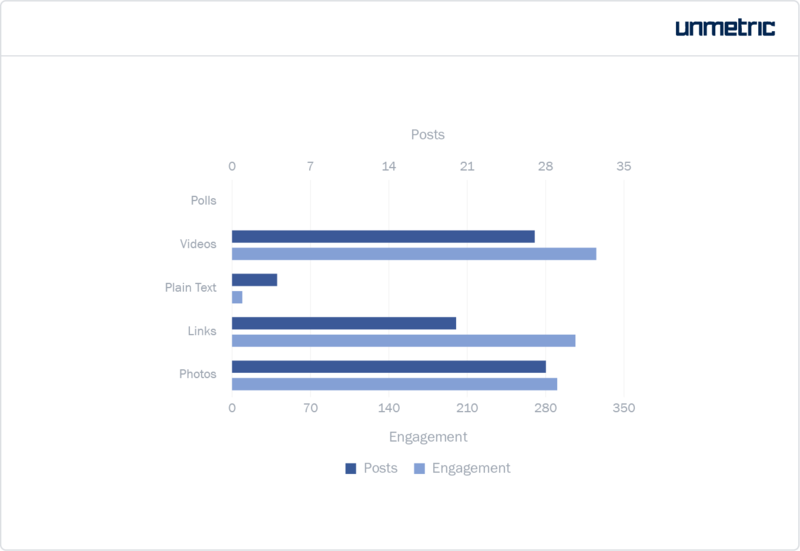 By measuring the engagement ROI of each type and figuring out an ideal volume, the brand does not miss out on the unique benefits of each kind of content. Further, if you look at the chart above you can see that each content type is performing equally well. In addition to a good mix of content types, Capital One also addresses a variety of topics. This is evident in the campaigns they ran during the time period studied. As part of the #MLBMemoryBank campaign, BofA asked their audience to send them their MLB memories throughout the season. These responses are sourced to generate quality content. Bank of America has been running this campaign since June 19, 2015. The light-hearted video leveraged Bank of America’s association with the Boston Red Sox. It goes to the scriptwriter’s credit that even those who supported other MLB teams enjoyed the video. The splendid performance of this video was a primary reason for the campaign’s success during this period. Most of these brands had a presence on other social networks too. Let us now explore if these brands were equally successful on Twitter and Instagram. The banks studied here use Twitter and Facebook differently. The returns they get from this platform also vary. A major difference is posting frequency. While on Facebook, these banks posted around 100 times in first half of 2017, they tweeted more than twice as much (223). How does this impact engagement? To put it plainly, Twitter engagement comes nowhere close to Facebook. 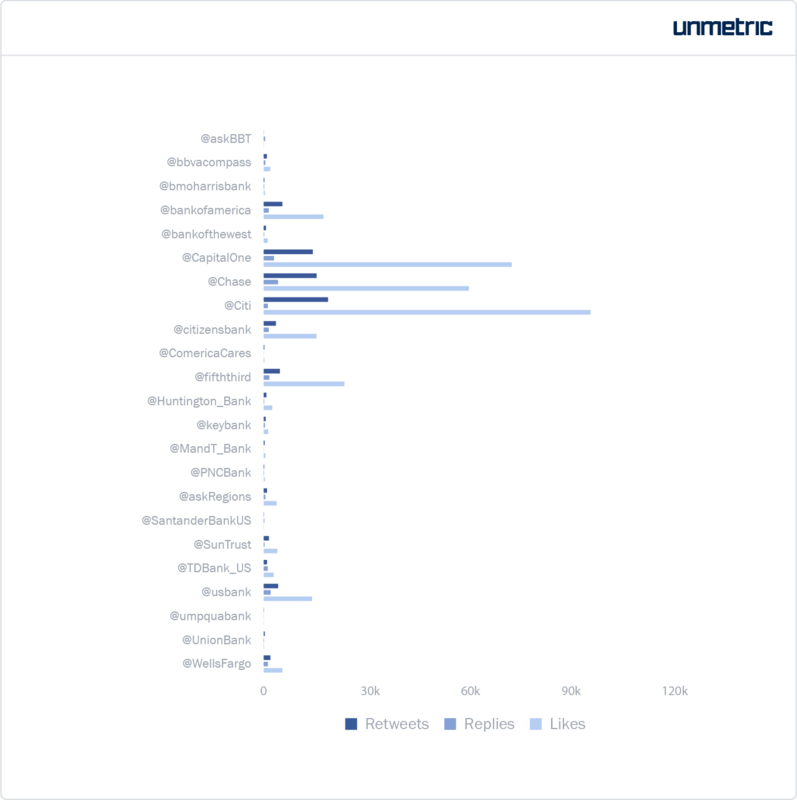 In comparison to the 606 interactions these banks would receive on a Facebook post, Twitter yields them a meager 82. Even with such abysmal engagement figures, let’s compare how these banks performed. 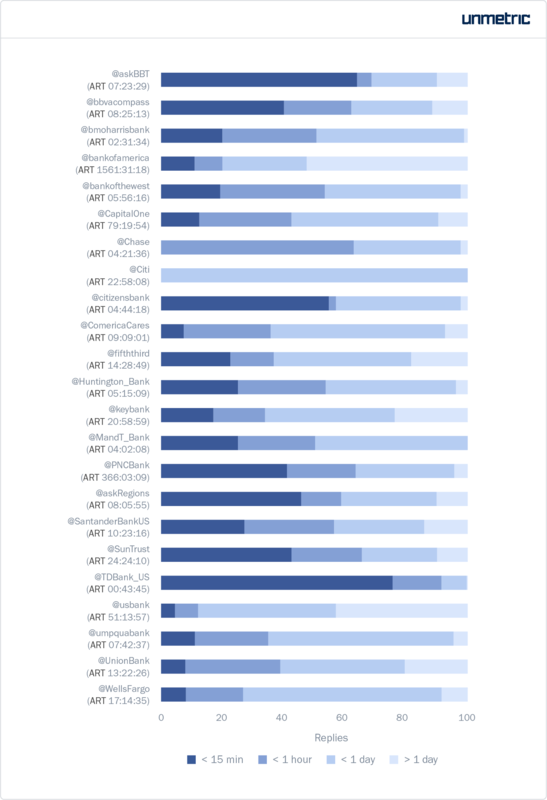 From the following chart, you can see that Citi had the most likes and retweets while Chase got the most replies. Citi received so many interactions because they had 627 proactive tweets. This was second only to Bank of the West. Capital One, which tweeted only 153 times, gets the most likes, retweets and replies per post. We cannot say if tweeting fewer times is the key to engagement. There was only a weak correlation between volume of tweets and engagement. 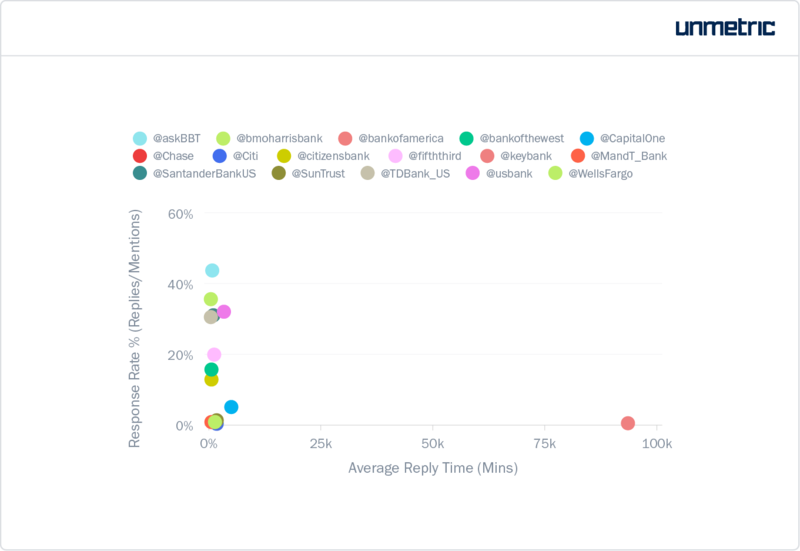 Capital One’s engagement was equally impressive on Twitter. On average, they generated 579 interactions on a tweet. Fifth Third was a distant second with 227 interactions per tweet. CSR initiatives and cause-related marketing usually win big on social media. Their most engaging tweet spread the word about their Annual Global Community Day. Chase leveraged Serena and Stephen’s massive fan-base to advertise their Quick Pay feature and it paid off. This tweet was promoted via Twitter ads, which further boosted engagement. Consistent engagement over a period of time gets your brand visibility on a user’s Twitter feed. By roping in a celebrity or running Twitter ads, they can always amp up their engagement around an important campaign or post. TD Bank is a cut above the rest in terms of customer service. They are the fastest to reply with an average reply time of 43 mins, 45 seconds. They also reply to over 30% of the mentions they receive on Twitter. The focus on customer service might be a reason why engagement takes a lower priority on Twitter for most banks. Only 13 banks out of the group analyzed here were on Instagram. On average, these banks posted 51 times in the first half of 2017. This is half of the posting frequency on Facebook and a fourth of that on Twitter. Is it even necessary for banks to be on Instagram? What do they even get out of it? The brands got better engagement on Instagram than they did on Twitter. On every Instagram post, they were likely to receive 104 interactions. 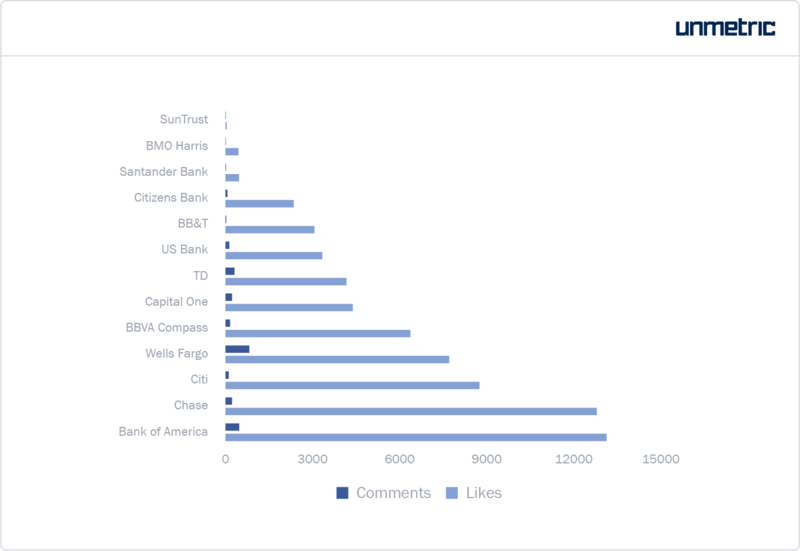 Bank of America received the most number of likes while Wells Fargo topped the charts with the most comments. Even though Bank of America generated the most interactions overall, Wells Fargo had higher interactions per average. This is because BofA posted more than thrice (97) as much as Wells Fargo (27). Most of the comments on this post praised Wells Fargo’s decision to pull support from the Iditarod race. Many saw the sled dog race as an animal rights violation. Obviously this had nothing to do with the contents of the post above. The most engaging post from the group was by Chase. The video featuring Serena and Stephen did not disappoint on Instagram either. 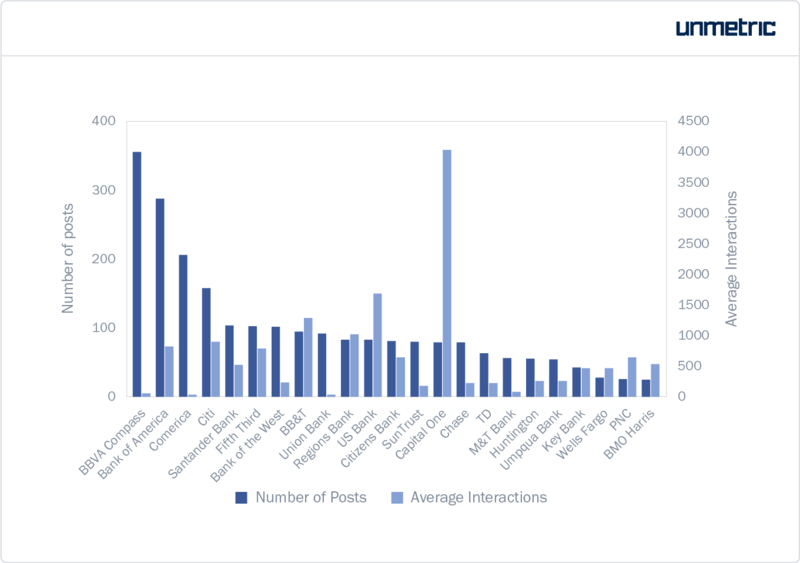 Though BofA came in 5th in terms of average engagement, overall, they got the most interactions. This is in part because they posted more times than any other bank (except BBVA compass). But how did they consistently engage their audience? If you take a look at their Instagram page, you will see that they’ve given priority to visual content, as the platform demands. Instead of just reposting content from their Facebook page, they’ve tailor-made content to suit the demands of the audience here. Most of Bank of America’s most successful Instagram posts were around Pride Month. When we looked at their content from the same period last year, the most engaging post was around the Pride March too. Identifying engaging content opportunities is crucial to social media success. This video is a great example of how they’ve used the format that works on the platform. This way, they are able to show their audiences what they’ve been up to, the values they stand by etc in an engaging fashion. Brands need to monitor engagement patterns from their industry and on each social networks, in addition to their own performance in the past. DIY ideas and recipes are popular on Instagram, especially around the holidays. Who’s to say a bank cannot tap this whitespace? In conclusion, for brands to sustain a meaningful presence on Instagram, they should create content that resonates with the audience on this network. Historical data on owned profiles and competitors’ performance is essential for brands to excel on social media. Add AI-driven insights to the mix and there’ll be no stopping you!